Thank you for all of your questions! We're signing off shortly, but you learn more about our latest announcements below. Hello Redditors, my name is Charles Walker and I serve on the Standing Rock Sioux Tribal Council. You may remember us from standing against the Dakota Access Pipeline, which we continue to fight in court. Our Tribe recently submitted a report to the Army Corps highlighting the dangerous impacts of the pipeline on our people and homeland (there is a link to the report below), and we are preparing for a spill. The Dakota Access Pipeline has already leaked five times along its route, and our Tribe's report to the Army Corps shows that the current leak detection system can't detect all spills under our water supply. At this time a spill of more than 11,000 barrels per day would go undetected, and would devastate our homeland. The impacts of spills and leaks on our community have not been properly addressed by the Army Corps, and they are unable to address a worst case oil discharge. And so we started a Clean Water Campaign so that we can establish a water safety system, which involves water monitoring systems, training a response team and purchasing equipment for spill response. Hi Reddit! I’m Joel Salinas, a neurologist that specializes in cognitive and behavioral neurology at Harvard Medical School and Massachusetts General Hospital and author of the memoir Mirror Touch. Short Description: I have synesthesia, which is a neurobiologically-based perceptual phenomenon that means that, whenever I experience something with one of my senses, I involuntary experience it through other senses, too. Among several forms of synesthesia, one form of synesthesia I have is mirror-touch synesthesia ("mirror touch" for short). The easiest way to understand mirror touch is for me to say that whatever I see someone else feel -- physically, emotionally -- my brain makes me literally feel, too. If you’re slapped on your right wrist, I feel like I’m slapped on your left wrist. If you’re gasping for air, I feel like I’m gasping for air. If you have morning sickness, I feel like I have morning sickness. Because of mirror touch, my brain categorizes you and me as the same person and tries to recreate your experience based on the situation and my own past experiences. In other words, “Mirror touch” is the experience of physically feeling my brain’s take on the physical sensations of whoever I see. Mirror touch is a mindblowing aspect of the brain that people hardly know about and -- whether you have mirror touch or not -- the more you learn about it, the more it’ll make you rethink every interaction you have. If you’re slapped on your right wrist, I feel like I’m slapped on your left wrist. If you’re gasping for air, I feel like I’m gasping for air. If you have morning sickness, I feel like I have morning sickness. The mirrored sensations can range anywhere from pleasure to pain based on the situation and my brain’s past experiences. If anything, mirror touch is like an automatic, conscious, very physical super empathy. TL;DR Description: Synesthesia is a family of unique perceptual phenomena (i.e., sensory experiences) that involves one type of sensory information triggering another (apparently unrelated) type of sensory information. This can involve experiencing colors with letters, shapes with sounds, taste with smells, and many many more exotic combinations. Mirror touch can thus be considered the synesthetic mixing of sight (and often other senses) with touch. Specifically, the sight of other people triggers a mirrored touch-experience. For example, if I were to see someone in front of me stroking their right cheek, I would feel a simultaneous physical sensation of a phantom finger stroking my left cheek. In seeing that touch, in a way, my brain automatically assumes that they are my reflection or that I am their reflection. In doing so, my brain uses whatever past experiences and predictions it can muster to conjure up the physical experience of touch on my skin, even though most of the time I know that it’s in my brain and not actually on my skin or in my body. The feeling is literal, mechanical, and pretty vivid. It's a measurable, falsifiable (therefore, not pseudoscientific) experience that I think highlights all the different ways that our brains can take shape due to genetic differences and much more. If we were to slow down the mirror-touch experience and zoom in on what’s going on, it’s not like a psychic link with the other person where their mental experience is channeled into me through some kind of pixie dust. Mirror touch occurs completely through my brain and my senses, not through anything supernatural. So, if I were hypothetically thrown into a silent, dark sensory deprivation tank -- like Eleven on Stranger Things -- and I'm completely unaware that there's anyone else outside the tank, my brain would have no information to trigger the mirror touch experience. The mirrored sensations can be anywhere from pleasurable to painful depending on how my brain categorizes the information, which is based on context and my past experiences. And there's really no limit to what my brain will try to recreate -- as close as possible -- regardless of what it sees, and regardless of whether I've physically experienced it before, like childbirth or death. If anything, mirror touch works more like a kind of automatic, conscious, very physical super empathy. That said: While mirror touch is a very natural part of my day-to-day life given that I’ve had it since I can remember, being a neurologist that works with patients on a daily basis and having mirror touch makes for an... interesting experience. I think my uncommon personal experience with mirror touch drew me toward medicine since childhood, and has continued to shape me as a doctor. It means that I’m more likely to share a deeper connection with patients, their suffering, and ultimately their care. The decision to pursue medicine really solidified while I was in the Amazon rainforest studying the interaction of biological health--physical and mental--with how we relate with one another. Having a little more insight into what my patients are feeling than most, I've always placed a lot of importance on my patients' needs as a person. Our thoughts, our feelings, and how we perceive and predict the world around us is precious. It helps shape who we are as a person, and other people in kind. This is why, in medical school, I was spellbound by the beauty and marvel of the brain and the emergence of human behavior, moment-to-moment. Thus, to be a neurologist, caring for people and their whole nervous system -- the motherboard of our reality -- represented a special opportunity to have a profound impact on a person's life. Reach out to talk about synesthesia, mirror touch, neurodiversity, brain health, or anything really (I'm chatty--and when I say “anything” I really mean ANYTHING)! You can check out peer-reviewed studies about mirror touch in reputable scientific journals here. Really looking forward to chatting with you! UPDATE: Going to step away, but I'll be back at 5pm EST to answer more of your questions! UPDATE: I'm back and ready for more questions! Bring 'em on! UPDATE: Thank you so much for all your questions! This was a lot of fun! I might pop back in later tonight to answer more questions, so please feel free to keep askin' away! UPDATE: I'm back to answer a few more questions before callin' it a night! UPDATE: Time for this neurologist to practice what he preaches and head to bed! Thank you, thank you, thank you all for asking so many awesome questions!! 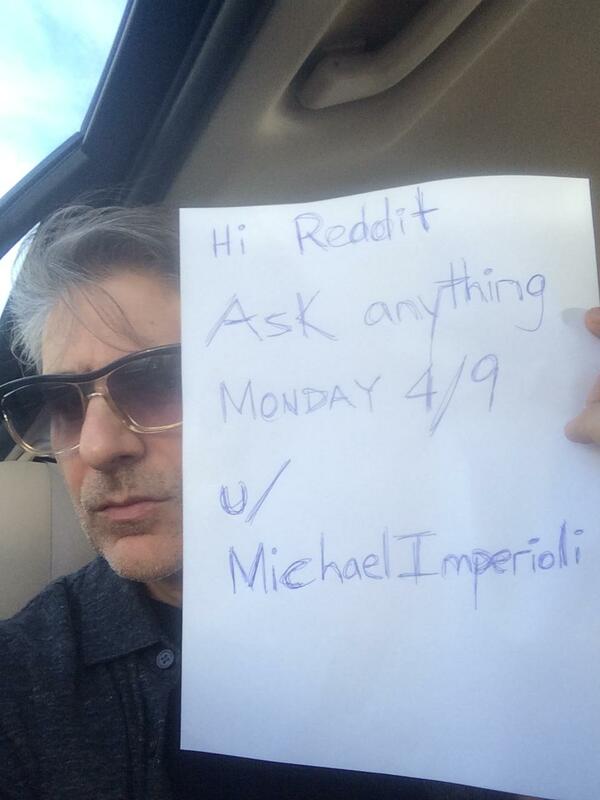 Hey, Michael Imperioli here. Ask me anything! I just released my first novel and it’s out now! “The Perfume Burned His Eyes” (http://www.akashicbooks.com/catalog/the-perfume-burned-his-eyes/). You can also catch me with Zach Braff in the new comedy series “Alex Inc.” Wednesday’s at 8:30PM/7:30PMc on ABC. My friend shared it to Reddit and the response was overwhelming. So many comments were incredibly kind, and only one person told me to kill myself. I count that as a victory. Some of you reached out to me to do an AMA, and I'm taking off on a road trip, so I've got plenty of time. I've been a Reddit lurker for years but never comment (as evidenced by post history). Looking forward to answering your questions and providing context to the video. Yes, I really do eat Oreos like that. Update: Folks, this has been great. I'm now entering Canada and will be signing off for the time being. Thanks so much for your hospitality and your great questions. Doing something worthy of an AMA has secretly been a career goal of mine, and this was even better than I hoped or deserved. I'll definitely come back some time if you'll have me. Until then, back to lurking I go! Let's go reddit! Playoffs AMA!! -- Musical Small Ball I have been working on for 5 years -- or anything on your mind. I am expecting weird questions, don't disappoint! EDIT Thank you for all the questions apology I could not get to more! I'm the lead developer of Monster Crown, the indie Monster Taming RPG with true crossbreeds! We're live on Kickstarter starting today! Randy and Jason Sklar have a knack for exploring what makes America’s cities unique and wonderful, whether it’s finding out who in San Diego serves the best burritos, why basketball is so popular among those in Bloomington, or why the people of Portland can't let go of their old airport carpeting. Randy and Jason Sklar's upcoming long-form audio documentary, Sklars and Stripes, is poised for an April 5, 2018 release on Audible. The docu-comedy captures their experiences on the road and, as a bonus chapter on Audible, all listeners receive a full album of the Sklars' stand-up from the tour: The TourTapes. The 6-hour Sklars and Stripes is exclusively available on Audible and Amazon now, and can be downloaded for free with an Audible 30-day free trial or as a premium Audible credit for members.